Some exotic species of plants and animals are causing great harm to our rivers, streams and lakes. As boaters, we can help prevent the spread of these invaders by taking some simple precautions. Here is a discussion of three of these harmful exotics and what you can do to help. Origins: This is an algae that naturally occurs in pristine waters in North America and Northern Europe. In these areas, the water has low levels of mineral and organic content which historically limited the growth of Didymo. However, since the mid-1980s Didymo has begun to take on characteristics of an invasive species in that it is spreading to new areas thereby expanding its original range. Click here for a map of the current distribution of Didymo infestations. Description: It forms massive blooms on the bottoms of rivers and streams (rarely in lakes). It makes a thick brown layer that smothers rocks, submerged plants and anything it can attach to. Impacts: It changes the ecology of a stream by smothering out plants and invertebrates that fish and other steam inhabitants feed on. The mats also reduce rearing habitat for many fish species. In addition, decomposition of the algae mats decreases dissolved oxygen, reducing stream productivity. How it is spread: While it probably is also spread by wild birds and animals, it is thought that the primary vectors, especially over long distances, are boaters and fishermen who have the microscopic cells attached to their boats, boat trailers, shoes, waders, life vests and apparel items and then put these items in other waters before cleaning them. Check: Before leaving a river or stream, remove all obvious clumps of algae and look for hidden clumps. Leave them at the affected site. If you find any later, do not wash them down drains; dispose all material in the trash. Clean: Soak and scrub all items for at least one minute in either hot (> 140 degrees F) water, a 2 percent solution of household bleach or a 5 percent solution of salt, antiseptic hand cleaner or dishwashing detergent. Dry: If cleaning is not practical, after the item is completely dry to touch, wait an additional 48 hours before contact or use in any other waterway. Be aware that absorbent materials, like felt-soled shoes and life jackets require additional soaking times, 30-40 minutes. Felt soles in particular present a high risk of cross-stream contamination; they’re right there in the water, and the microscopic Didymo cells can easily attach to them. Another control method that works well for felt soles is to freeze them, preferably overnight. If you brought your dogs along, wash them thoroughly with soapy water or make sure the coat is completely dry, before letting them swim in another watercourse. Zebra and Quagga Mussels, Dreissena sp. Origins: Eurasia’s Black and Caspian Seas and Dnieper River drainage. Probably came to North America in ship ballast water that was emptied in the Great Lakes. 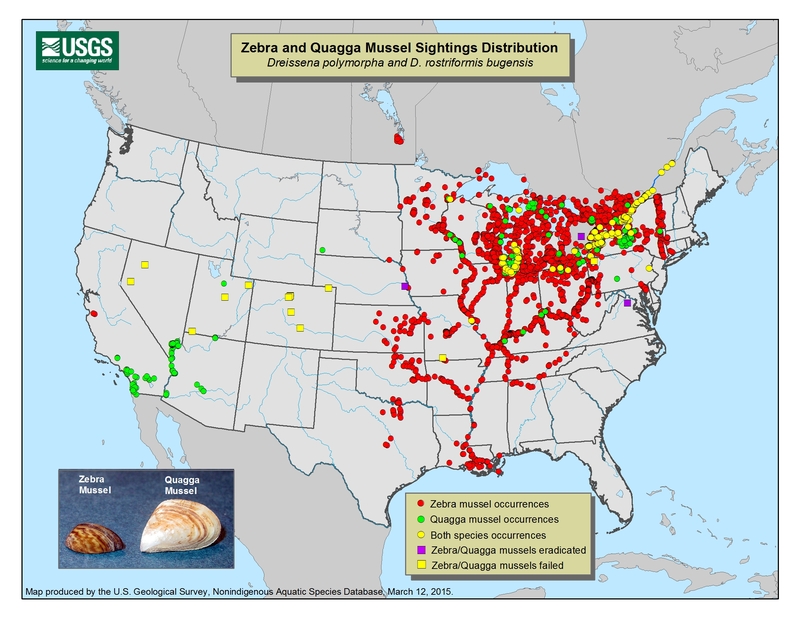 Click here for a US Geological Survey Agency map showing current distribution of the mussels. The red dots indicate Zebra populations and the green ones Quagga infestations. Description: Small, up to two-inches long, bivalve mollusks that have a dark and light “zebra stripe” pattern on their shells. Impacts: They are very efficient filter feeders, with each mature adult filtering a liter or more of water per day. They remove the plankton, nutrients and bacteria that native invertebrates and small fish feed on, devastating the local ecology. Their efficient filtering cleans and clears the water allowing sunlight to penetrate deeper into the water column. This leads to growth of algae on deeper levels of the stream or lake bottom. When the algae mats decay, they produce noxious odors and taste in drinking water supplies and also deplete dissolved oxygen. The mussels clog municipal water intakes and coat docks, buoys and boats left in the water. They also attach to native mussels and clams, effectively killing them. How they are spread: Each adult female puts out over a million eggs a year, which are spread by downstream movement. They are also spread from water course to water course by boaters and fishermen. Adult mussels can attach to boats and trailers. Eggs and larvae can attach to boats, trailers, shoes, life jackets and apparel. Remove all aquatic plants and mud from everything that came in contact with water. Drain all water, including bilges, live-wells and cooling water from boat motors. Cleaning out the cooling water system of a motor is tricky. A solution of household bleach (3 oz. per 5 gallons of water) does a good job, but may be harmful to the motor. An alternative is flushing it with hot water (> 140ºF) for about a minute. Clean and thoroughly dry everything that came in contact with the water. With hot, soapy water, scrub down all surfaces that have come in contact with boating water. High-pressure washing with hot, soapy water is most effective. Some reservoirs now have washing stations at boat launch sites. Pay particular attention to boat trailer pads, which can hold tiny mussels and larvae. These harmful mussels have spread throughout the Great Lakes region and the Mississippi River and its tributaries. They have also jumped to watersheds in the West, undoubtedly transported by boaters. Arizona’s Lake Powell and Lake Mead are two of the most recent bodies of water to be struck with infestations. Any rafters and kayakers exiting from a Grand Canyon trip should pay special attention to thoroughly cleaning and drying their gear before using it in any other water course. You don’t want to be responsible for transporting these devastating pests to other unaffected bodies of water. In addition to Didymo and Zebra and Quagga Mussels, there are other invasive plant and animal species that are harming the waters we all use and love. Educate yourself about them with Internet searches, contact with local fish and game agencies and soil and water conservation agencies. Take the time and effort to do your part to prevent the spread of these harmful organisms. Together we can make a difference!